Serendipity from Jewels : Spring/Easter "Mantle"
I do not have a mantle in my home...GASP!!! I do however have the top of my piano that I love to decorate for the seasons. I love how this turned out. I have gathered items over the years from the most unusual places. The duck and the rabbit on the ends I found at Walgreens in their outdoor section 2 years ago. The year before that the plant looking bunny I found at Target(I gave it some height using antique childrens books) . The 2 bunny topiaries were easily made from 2 pots from the one spot at Target,I inserted the moss bunnies from Pier One into floral foam, topped with glass stones for weight and added a twine bow. I typed up the subway art using a word document and printed off and added it to my frame (I rotate art into that frame for the different seasons the best thing is you can keep all the seasons stored right there in the frame). The wreath I found at Target in the One Spot as well hung with a leftover piece of burlap. The carrots are also a Pier One find. The smaller carrots are actually a napkin ring and I simply placed them on top of candle holders I had. 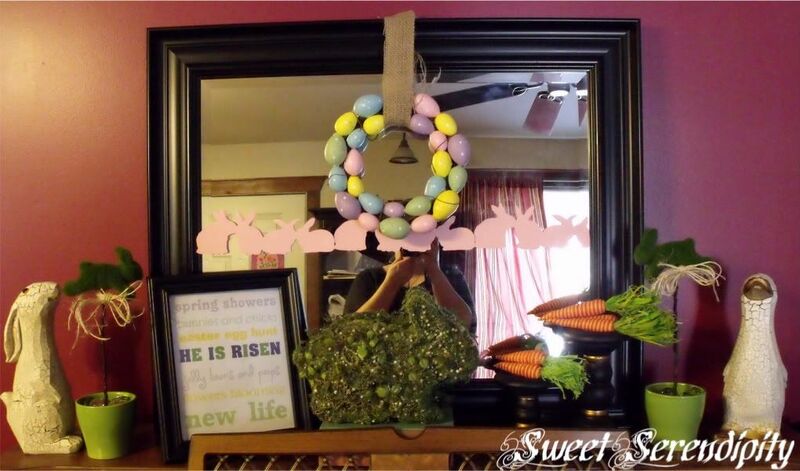 The last thing I added was the bunny silhouettes across the mirror. I debated over and over pink or black bunnies and opted for pinnk but that could change quite easily. This looks so cute. I would love to see the subway art up close. I am looking for a cute one. Found you on TT&J! I picked up that same wreath at tarjay! Cute mantel - it is so fun to decorate for all the different holidays! I have two mantles and neither one is as cute as your piano. stopping by from Trendy Treehouse! I have a mantle but I don't do a very good job of decorating it. I prefer to decorate a table any day. You have a great group set up there. Job well done.